Awesome job! I've heard many Beatles cover bands (including Beatlemania, who my band once did a gig with), and there's always something inaccurate or lacking in the end result (i.e. tones not quite right, vocals not accurate, etc), but you guys really nail the required feel of the song. Not an easy thing to do, IMO. whereever did you find your string section? And who's the fellow with his back to the camera the whole time? It looks like he's playing keys? 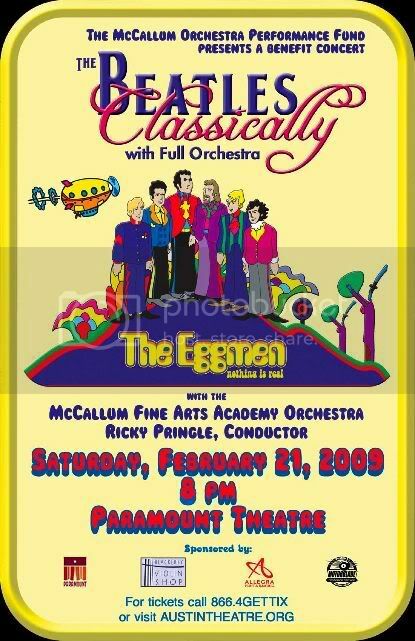 They're a small part of the local performing arts high school's orchestra, we've done several shows with them over the years, we were promoting an upcoming show and obviously couldn't fit the whole orchestra in the tiny radio studio. The nut with his back to the camera is our keyboard player, the studio is so small it was the best fit for him to stand backwards with his keyboard against the wall. Wish I was in the area and could catch the show. Best of luck on the 21st!